Jane The Virgin — “Chapter Eighty-Two” — Image Number: JAV501b_0084.jpg — Pictured (L-R): Gina Rodriguez as Jane and Brett Dier as Jason — Photo: Jesse Giddings/The CW — ÃÂ© 2019 The CW Network, LLC. All rights reserved. 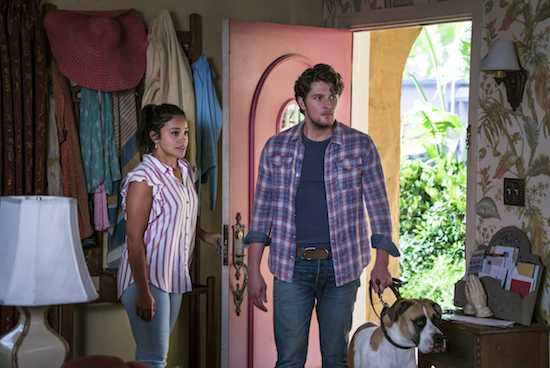 After three episodes of JANE THE VIRGIN’s Michael (Brett Dier) being sans memory—and going by Jason—it seemed Jane (Gina Rodriguez) and her back-from-the-dead husband were about to part ways. With Jane looking to move on with her life, including a future with Rafael (Justin Baldoni), Jason reluctantly signed divorce papers and told Jane he was going back to Montana. “I guess this is it,” he told her. Though Jason brought Jane a fishing pole (a nod to their date) as a gift, she returned it, noting she’d never use it. But after Jane told him goodbye, and shut the door…he accidentally scraped the ceiling of her porch, which led to paint scrapes to fall on Jason, a la snow. Suddenly, Jason was hit with a flood of Michael’s memories returning.